Welcome aboard! Anyone who has been carried across the Atlantic or Pacific Ocean by plane will probably have concluded that it was a long, boring trip. Not so. Or at least not by comparison to the travellers of decades ago when ocean liners were ‘the only way to cross’. We’re talking about days and days at sea, interrupted only by meals. For some passengers, mal de mer sharply reduced their appetites. For others, the bar was the beacon, particularly during Prohibition in America. The shipping companies were aware of the days and days of uninterrupted boredom facing passengers, so they provided games and sports as distractions. 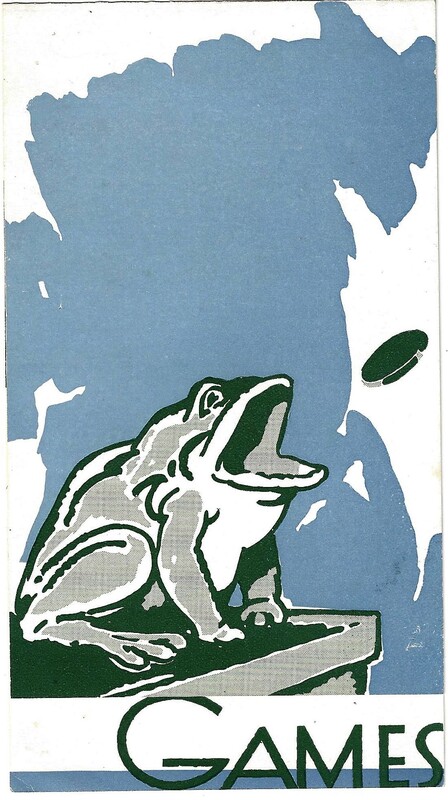 This ‘GAMES’ booklet from the legendary S.S. Normandie describes and illustrates ‘Little Olympics Afloat’ on the expansive deck space for tennis, shuffle-board and other sports in what they describe as a ‘Stadium at Sea; A Work-out on the Waves’. Also, there was the gymnasium with its rowing machine, hand-ball, and a shooting gallery; and Sun-Deck Sports and Sea Air including Tennis and Trap-Shooting. Exhausting! 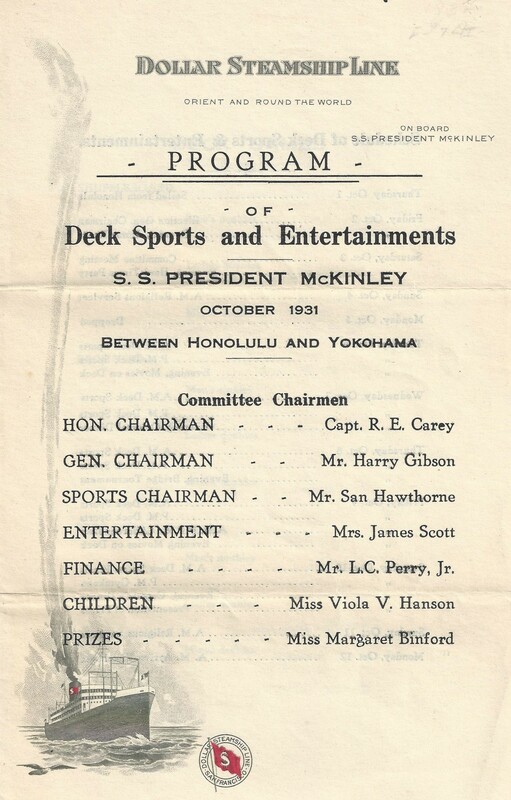 For the 12 days between Honolulu and Yokohama in 1931, the S.S. President McKinley offered a daily schedule of sports capped off with a ‘Gymkhana’ on the final day of the trip. Other ships offered Bridge and a variety of other games, and on board a British troopship in 1940 there was even a boxing match between members of the Royal Air Force (R.A.F.) and the British Army! The trooping experience must have been a stressful one, because it was December 21, 1940 on board the Viceroy of India of the P&O Line. She had been requisitioned by the Government and converted for trooping service only the month before, and these men were off to battle – somewhere!